LVD Strippit, Akron, NY, introduces the Vari-Vee V30-140 CNC adjustable V-die, engineered for use in its complete range of PPEB and Easy-Form press brakes. The Vari-Vee V30-140 complements the company’s heavy-duty Vari-Vee option. This smaller die offers the benefits of a variable and adjustable-bottom V-die to a broader range of press-brake models—from 320 to 1000 tons, with length to 315 in. The die provides automatic adjustment of the V-width in increments of 0.39 in., minimizing setup time and providing flexibility. The variable die allows the bending of sharp angles, to 50 deg. for the maximum V-width, particularly useful when forming high-strength materials exhibiting significant springback. The radius on the V-die is a hardened insert machined with LVD’s patented Stone compound curve, for optimal rolling and friction-reducing properties. 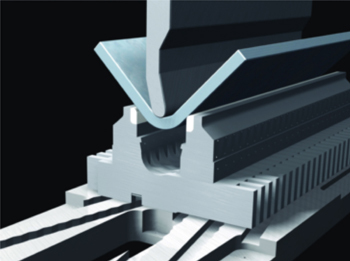 The die proves ideal for applications that demand bending of different thicknesses of materials; frequent die changes; bending thick materials with large V widths or different radii on the same component; and for bending high-strength materials that tend to crack while bending.